Party agents who do not agree with the decision of presiding officers during the counting process, are advised to lodge their complaint in writing to the Supervi­sor of Elections. The presiding officers demostrating the poll count to the Polling Agent on September 3,2018.Photo:Simione Haravanua. The clarification was explained to political party agents, who were pre­sent during the 2018 General Elec­tion mock elections counting session at the Fijian Elections Office in Suva. 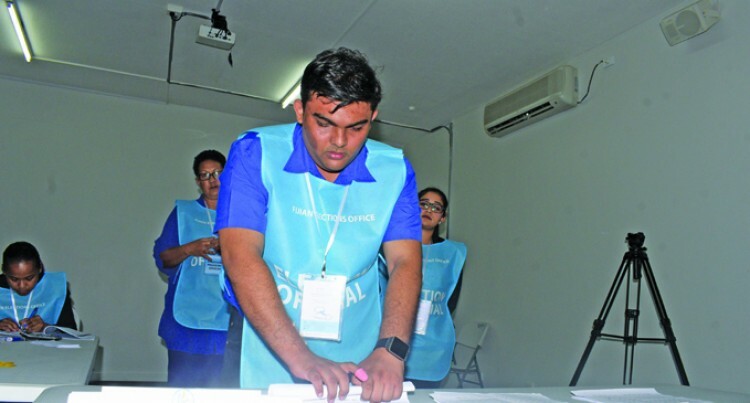 During the mock counting session Monday, National Federation Party vice president Seni Nabou objected to an invalid ballot paper and stated that she would like to lodge a com­plaint. After making a decision on the in­valid ballot paper the presiding of­ficer told Ms Nabou to refer her com­plaint to the Supervisor of Elections after which she continued onto the next process of counting. Mr Saneem then explained that once the presiding officer had made a decision it was final. However, if party agents still objected to the same they would have to refer their complaint in writing to the Supervi­sor of Elections who would then deal with the complaint. “During the count the presiding officer has the final decision. If a polling agent objects the presiding officer will consider the objection thereafter the officer will inspect the ballot paper and make a decision on it,” Mr Saneem said. After the supervisor has received the complaint he will then liaise with the presiding officer after the count has finished and deal with the complaint accordingly. “Just because someone says hold on I need to make a complaint now the count will not stop,” Mr Saneem said. FijiFiji SunFONUA TALEISupervi­sor of Elections.